Meet your new summer lover. His name is Chowder. Or, Chow-duh if you like to LIVE ON THE EDGE. He’s gentle, tender, smokin’ hot, probably has a mustache and I’m weirding even myself out right now. So, my M-I-L visited last weekend and brought with her what some would call a whoa-Nelly-seriously-what-the-h-colossal-crap-ton of corn. While she was here we grilled it, sautéed it and chewed it right off the cob. When she left we thought most of the corn damage was done. We doth thawt wrawng. Right. He Mmmm’d, you guys. I heard the Mmmm. But listen. Come hitherly hither. I need to tell you. This here chowder has a slap-ya-booty punch of smoked paprika so grande, you won’t even believe what’s happening to your body, much less your miiiieeeeennnnddd. And do I even need to mention the splash of cream, the seared plump shrimp and the crumbled bacon on top? Oh, yes? Okay! You guys, we’re talking a splash of cream, seared plump shrimp and crumbled bacon on top. Hey, if you need to Mmmmm right now, I totally get it. 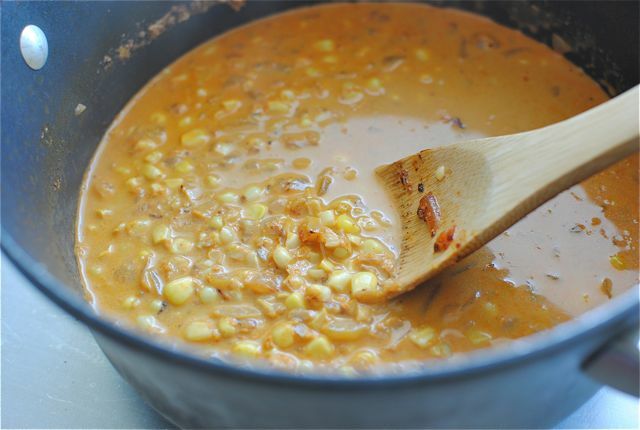 Add the fresh corn to the pot and toss to combine. Heck, sauté another minute. Add the stock and half & half to the pot. Stir to combine. Keep on a low simmer for 15 minutes. Taste it. Need a little salt and pepper? Add a pinch or two. MMMMM....LOVE chowder in the summer! I've always been on the fence about mustaches, but I could overlook almost anything for a bowl of this! First, I love your blog. It seriously cracks me up. The other day when you said you thought the waiter wiggled his naked toes in your dish, that made me almost pee a little. Second, this looks AMAZING! Making this soon. Thank you! It's 100 degrees outside. And I want this. I need this. Now this is one amazing lookin bowl of goodness. I could literally eat it (or do you drink soup) right off the screen right now. WOW - love it! I'll just jack my A/C down to 65 and eat till my hearts content!!! :) Looks super yum! Mmmm...that turned out to be a fabulous idea! Whoa. I so NEED this! Mmmm is right. Now my omelette seems sadly lacking. Been trying to talk my man into grow his stache, just to see, he's not going for it. Seriously Bev, this chowder looks seriously good! This looks gorgeous and flavorful. It has all my favorite ingredients all in a bowl! can't wait to make some! Mmmm chowder, I love it! And you know how I feel about smoked paprika. I'm on it. I had some killer corn chowder at Cafe Gratitude last night too - just as a side note. This looks so good to me right now, I had to pin it. 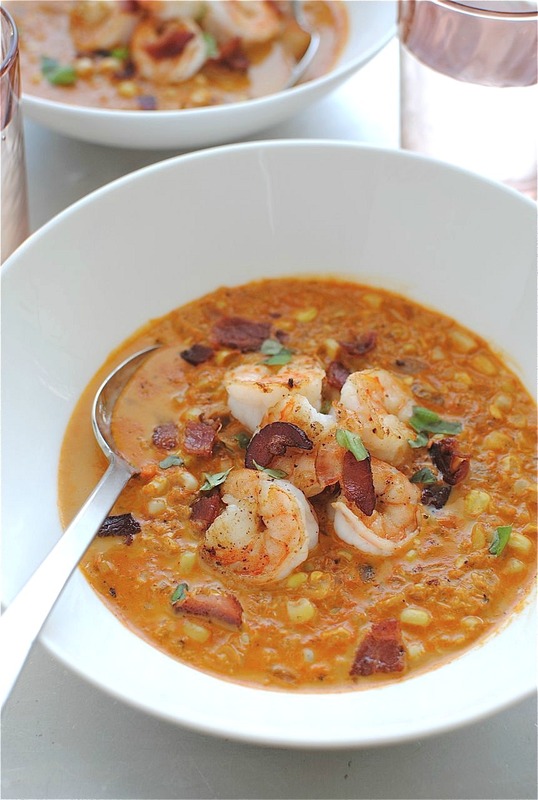 Corn and shrimp just go together and the color of the chowder is sultry and makes me want to make a quick decision for this weekend's cooking. You had me at "hello"...or "mmmmm"...or "shrimp"...or "chowder". Or maybe all of it. Whatever. I am just so glad that you are here to make my dinner dreams come true. :) Happy Friday!! Good M I L's always bring food. Even if it is 150 thousand ears of corn!! Peaches and Cream corn!! wow, this looks so good! this is kind of like a cajun-ish dish..i kinda LIKE it! love the smokey flavor! Oh girl, we could do with some of this chowder in Colorado right now. Lovely! Hi! Great recipe! 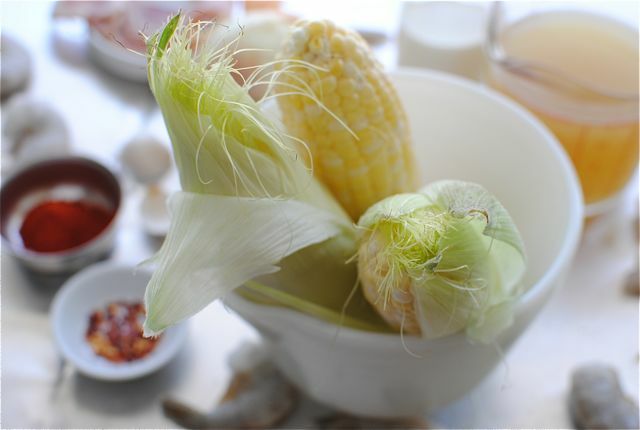 I love corn and can't wait to try it. But I'm quite new to the cooking scene and have a stupid question: when you say fresh corn, did you pre-cook this? Meaning, did you boil them or anything then add them to the pot? I have a feeling I know the answer. But I learned early that assuming in cooking is a bad idea. Anyway, thanks! Hi, Clare! No boiling - just cut straight off the cob and into the pot! They'll simmer and cook in the pot, so no need to pre-boil them first. Hope this helps! This looks so tasty and loaded with flavours! I wish I could have one bowl for the dinner! You out did yourself again Bev. I wished I lived next door to you. I would want to be your helper so I can learn how to cook just like you. Thank you ma'am. I will certainly try this one!! Your chowder looks amazing! I have never thought to add shrimp, but I will give that a try the next time I make some! Bev, the boyfriend and I are making this tonight, but we're going to add some salmon or tilapia as well..Will let ya know how it turns out, looks really good!! Yup, turned out deliciously! We ended up adding a few sole filets and did not add the bacon (though this would have been awesome, too), and we loved the way it turned out. Excited to have the leftovers tomorrow for lunch! Made this tonight.. not sure what the problem was (followed the measures exactly), but the end result was thin and runny, despite following the directions to cream part of the chowder. Shrimp sunk to the bottom, so all in all it didn't have a very appetizing appearance. I personally think it could have used a whole lot more corn..perhaps the ears I bought at the store weren't as large as others might have access to. Tasted great, tho. I'll try again. Oh no! I'm so sorry to hear this, LC. I added my shrimp right at the end, but of course stirred them in once I started eating. And yes, maybe more corn next time? I'm so sorry it didn't work out for you this time. Hopefully it will get better and better though. Thanks for letting me know, none the less! looks divine girl! Pinned it! That looks so incredibly delicious!!!!! Looks incredible! I've only made a few chowders but never with shrimp. I love the flavas (if we can call it chowda I can say flava, right? Riiiight....) goin on in this dish! I made this for dinner tonight. It was fan-flippin'-tastic. I used 1/4 tsp of chipotle powder and 1 tsp of paprika since I didn't have any smoked paprika. I also used smoked salt to up the smokey ante. I will definitely make this again! Mmmm. This was fantastic! I think it may be the first time though that I would have preferred to not use the immersion blender (usually my fav tool). I think having part of the soup totally pureed, then the rest of the corn in whole pieces would've been better than the many not whole/not pureed pieces we have, but that's just a personal preference. The flavor was great and I can't wait to make it again! I made this last night and it was excellent! My husband-went-for-seconds-excellent! I doubled the recipe and it was still perfect. I can't wait to eat this for dinner again tonight and try out more recipes. Thanks for blogging! Since we're in the deep freeze finally (73*) and I'm freezing sweet corn today, I decided to make this. It did not disappoint - absolutely fabulous! Thank you! Made this for supper today; sooooo yummy! This was SO tasty! I added a splash of Grand Marnier to kick it up a little- It was amazing! Thanks for the recipe! I made this last night - delicious!!! I pinned this recipe a few weeks back and finally made it last night. Can you say Phe-nom-nom-nom-enal?! The pictures are what initially lured me in. I'm love fresh corn! And the clear directions and delicious ingredients are what hooked me. 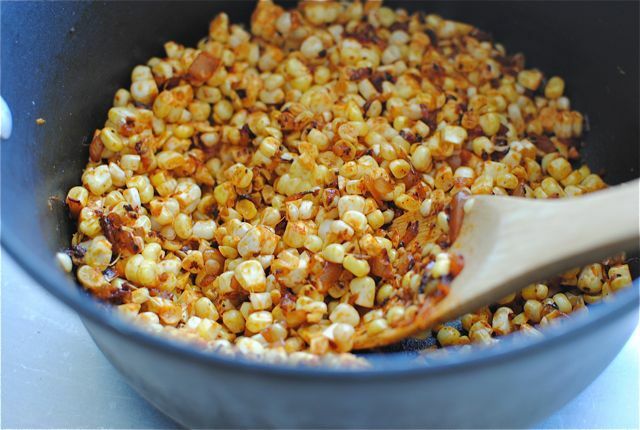 I used frozen sweet corn since I already had some but I can't wait to try it with the fresh stuff. My sweetie nearly cried when he saw that I didn't make enough for leftovers... Next time, I'll be using the big pot :) Thanks for sharing this awesome recipe! 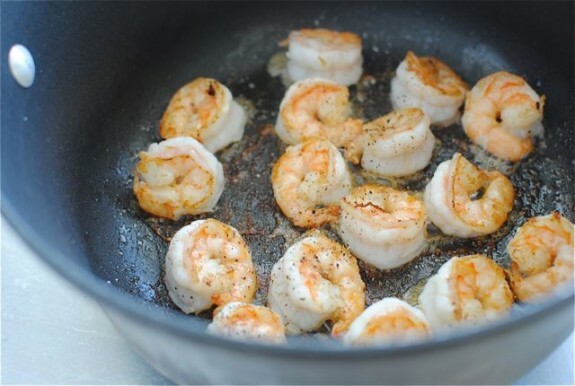 Don't hate me for asking a stupid question but does this recipe call for cooked or uncooked shrimp? I'm dying to make it tonight! Hi, Shea! Nooo hating here. Uncooked, all the way! It will cook in the chowder. You can buy it frozen and just peel it yourself. Let me know how it is! I don't have fresh corn. Will it still be good with frozen whole kernel? Sure sure! Or even a can of corn would work just fine! This recipe came out AWESOME!! My husband & son were starving, skeptical that "soup" was going to be enough. They LOVED it! 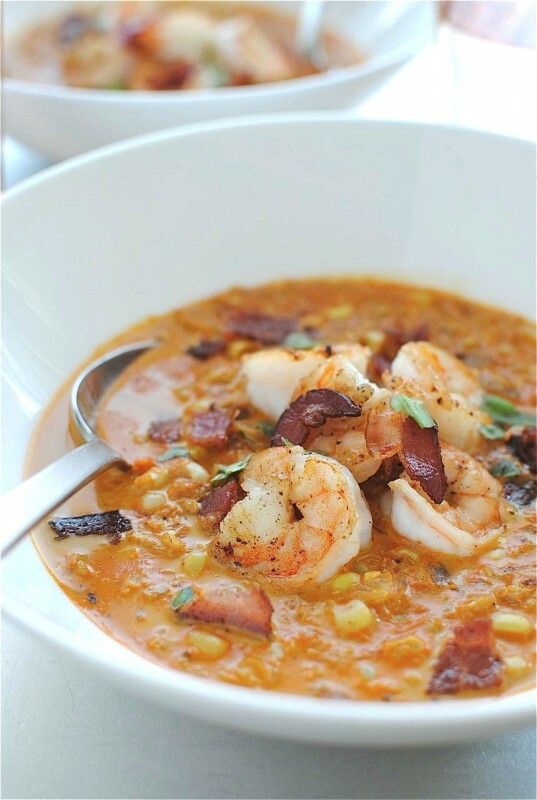 I topped each bowl with a bit of shredded white cheddar, green onions, bacon & the shrimp. It looked beautiful & impressive! Made this tonight. Instead of smoked sweet paprika, I grabbed the smoked HOT paprika. YIKES! Hubby, who loooooves spicy food, loved it. I agreed, the flavor was wonderful. Next Sunday, I'll make it again and grab the correct paprika. ;). I can't wait! Oh, I also did a quick char of the corn on the grill before hand. Yum :). Tried this and it was runny and thin....I'm not sure what I did...any idea's what I can do next time?? It still tasted good. :) Thanks! just made this for dinner tonight. since it's winter, i used frozen corn instead of fresh. even so, this was seriously awesome. thank you for sharing this recipe with the world!!! i think my husband is going to expect this to appear in front of him in a weekly rotation now! For frozen I would throw in maybe a cup to a cup and a half! I used 3 fresh ears, and I think it amounted to about 1 1/2 cups. Let me know how that works for ya! Thank you for this recipe!!!! I doubled it except the onion and used 1tbsp regular paprika, 1 tbsp Dash Chipotle. Used 1 can of corn. Turned out spicy and delicious! Usually my husband doesn't like spicy, but he loved this. I made this it was very good. I think I did something wrong. Maybe cooked the onions to long. The soup looked a little black. It still tasted awesome! Made this last night and it was amazing! I added some red skinned potatoes and frozen corn. It was absolutely delicious. Will definitely make it again! Yum!!!! Left the bacon out unfortunately because I don't eat pork, but it was stil delicious! Thanks for the recipe and you're hilar. Was wondering if leftovers can be frozen. Ya know, I'm not 100% sure! I would think it would, but I don't want to tell you that, and then have it separate or get icky when reheating. Did you try it? How did it turn out? Soooooo gooood! I've made this twice now and my husband will not shut up about how AWE-freakin-SOME it is. Never made chowders because I'm dairy free but tried this with plain coconut yogurt (1 little container, 1.5 for doubling the recipe) instead of half&half. Delish! Also used can if corn instead of fresh. My only regret is not adding more bacon! Our mouths are happy! Thank you! I am making this tonight. 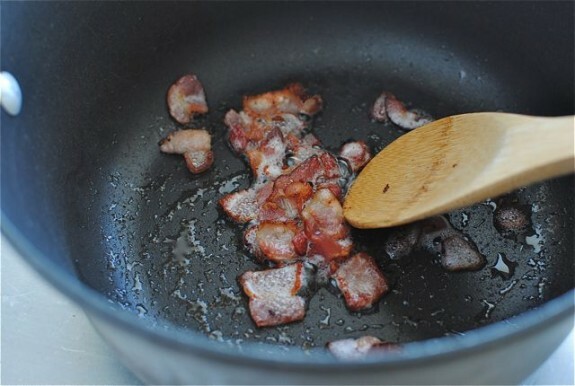 It looks wonderful, but I just want to make sure you use 1 Tablespoon of Smoked Papricka? I have never cooked with smoked paprika, but that sounds like a lot to me.. I just want to make sure she did not mean 1 teaspoon. Thanks!! that's a good question - because the recipe she based this on says 1/2 tsp and it serves 6! so using 1 tlbs for 2 servings seems excessive. But then hers looks more red where the original recipe looks more creamy. Did you make it Emily and if so how much paprika did you use? thanks! Hi, This looks and sounds delish! I'm making it this weekend but I see this only serves 2 and I've got at least 12 people so I'm doing everything times 6. Does that seem like too much? there will be other food/apps but this is main event. What size shrimp did you use? Thanks! Hey! For the shrimp, I used extra-large. Not the hugest colossal kind, but the extra-large. They shrink a little when you cook 'em. But I wouldn't go any smaller for this. You could very well multiply it! I say taste as you go. 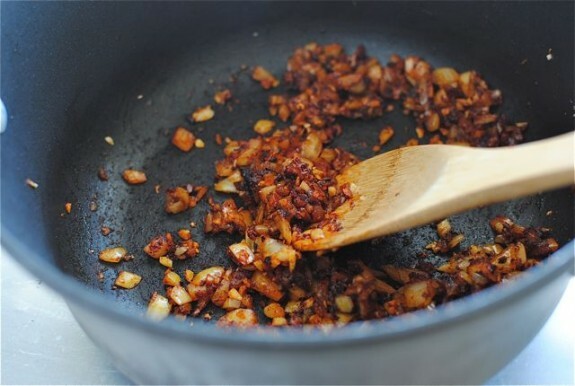 Go light on the paprika until you get a good deep taste you like. Just keep tweaking until it tastes phenom and feeds your crowd. You can go as creamy as you want. Let me know how it turns out! thanks so much for getting back to me!!! really appreciate it! Oh good! So the tweaking worked. So glad, so glad! Made this tonight with fresh local sweet corn! Instead of red pager flakes, I used spicy Hungarian paprika. Super yum! This turned out fabulous! I used frozen corn because it's no longer corn season, but it was still Great! Thanks! I know I'm a bit late to the party, but I snorted out loud laughing at the mustache line. Can't wait to try this recipe! Found this on Pinterest and made it this weekend. It was the most amazing soup I have ever made! Thanks so much! Made this for dinner tonight and WOWOWOW. Instant winner. I will make this about a million more times in my life. 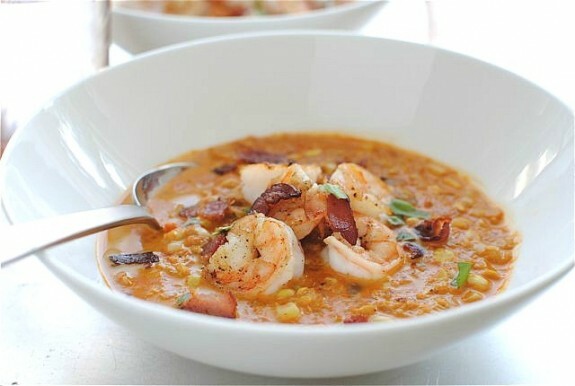 Thoughts/suggestions for future attempts: -This soup is rich enough to eat without the shrimp, I'd consider the shrimp "optional" -Next time I may try making pancetta instead of bacon and throw that into the soup at the end rather than adding the bacon garnish -Blend a LOT of the corn up in the blender/hand mixer...I love chunky soup but this was super chunky Flavors were incredible, especially considering I ate this right after making it (usually soups taste wayyy better after a night of sitting in the fridge but this was great right off the stove.) Thank you! Best dish I've ever made. Added potatoes, red curry and chili powder and served with a touch of sriracha. Really proud of myself :) Thank you! I made this for my family tonight and it was delicious. I cooked this in my cast iron dutch oven, added two red potatoes and thickened the broth with Wondra because otherwise it would've been brothy and not a thick chowder like the we wanted. I'm saving this recipe in my box, it was that good!